The FastTrack process provides onboarding and user adoption services. 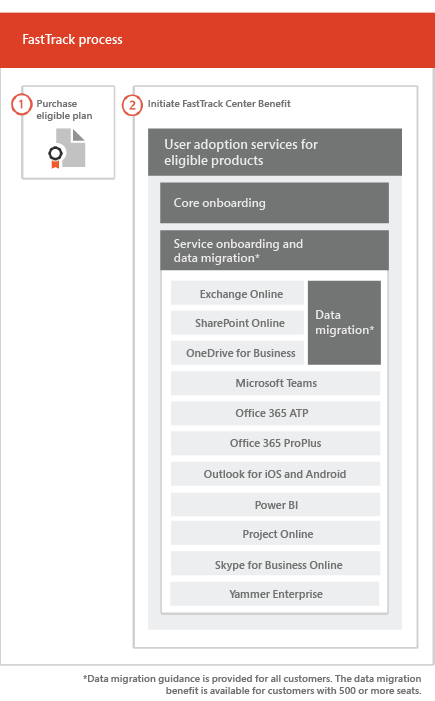 Core onboarding — These are tasks required for tenant configuration and integration with Azure Active Directory (Azure AD) if needed. Core onboarding also provides the baseline for onboarding other eligible services. Service onboarding and migration — Service onboarding tasks enable scenarios in your tenant. Data migration (including email and files) is covered in Data Migration. User adoption services are comprised of tasks that provide guidance for you to ensure your users are aware of the eligible services and can use them to drive business value. This assistance occurs in parallel to onboarding activities. FastTrack provides customers with a recommended approach, guidance, and best practices engineered to deliver quick and predictable outcomes. If you choose to deploy outside of this guidance, your onboarding experience and usage of the service may be impacted. Guidance is defined as a combination of verbal and written assistance. When FastTrack Specialists provide guidance, FastTrack personnel cannot act on your behalf. You can use FastTrack services to onboard and adopt any qualifying product workload as long as your subscription is current. The following diagram illustrates the onboarding process. You can get help through the Microsoft 365 admin center or the FastTrack site. To get help through the Microsoft 365 admin center, your admin signs into the admin center and then clicks the Need help? widget. Sign in to the FastTrack site. Complete the Request for Assistance with Microsoft 365 form. If you have a partner listed in your Office 365 tenant, you won't see this option. Please consult your partner for assistance. You can also ask for FastTrack Center help from the FastTrack site in the list of available services for your tenant. Once onboarding assistance starts, we set up a schedule of online meetings. Search for your customer or select them from your customer list. The following table lists roles and responsibilities for the process. Provides all onboarding, migration, and user adoption services remotely. Assists you remotely by using a combination of tools and published documentation. Works directly with you or your representative. Provides email and data migration guidance. Provides guidance with core and service onboarding and planning successful adoption of eligible services. Provides assistance and is available during normal business hours for a given region. Provides assistance in Traditional Chinese and Simplified Chinese (resources speak Mandarin only), English, French, German, Italian, Japanese, Korean, Portuguese (Brazil), Spanish, Thai, and Vietnamese.